The Grade Center is more than just a way to record students' grades. It's a dynamic and interactive tool, allowing instructors to record data, calculate grades, and monitor student progress. In addition to being able to record grades, instructors can track student work and share private comments and feedback with students throughout the semester. The Grade Center is integrated with gradable items such as tests, assignments, discussion boards, blogs, journals, wikis, and ungraded items, such as surveys and self-assessments. Instructors can create Grade Center columns for activities and/or requirements done outside of Blackboard, such as exams given on paper, oral presentations, and participation. 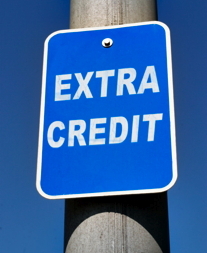 Students also benefit when their instructor uses the Grade Center. Students have the opportunity to adjust their approach to learning to improve their performance when they see their grades and instructor feedback. Have you ever met with a student and wanted to review the student’s grades in Blackboard, but couldn’t because the Grade Center shows the grades of all the other students? 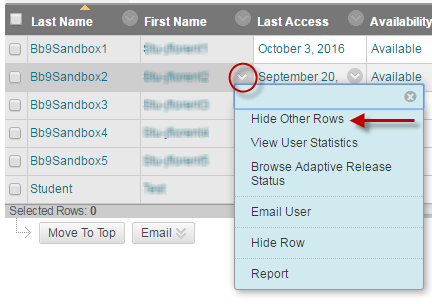 Row visibility allows you to temporarily hide the grades of all the other students and only show the grades for a single student. In the Grade Center, roll your mouse to the Last Name, First Name, or Username cell of the desired student and click on the drop-down arrow in the right of the cell. Select [Hide Other Rows] from the short cut menu. When done, you should only see the selected student. In the Grade Center, roll your mouse to the Last Name, First Name, or Username cell of the student and click on the drop-down arrow in the right of the cell. Select [Show All Rows] from the short cut menu. When done, you should see all students. 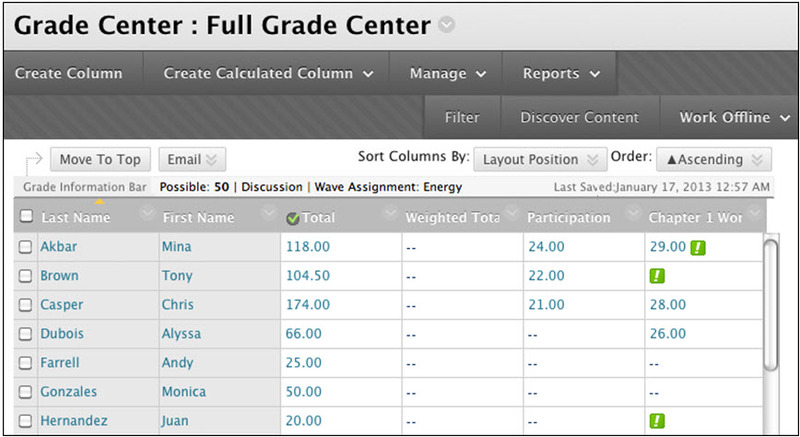 The Grade Center allows you to create weighted grade columns. There are several different ways to calculate weighted totals in the Grade Center. The total of all the categories should equal 100%. Categories are useful when you want to drop grades. Use categories to drop the lowest grade (or a number of grades) and then include the result in Grade Center calculations. Alternatively, you can use the highest grade in a category to include in Grade Center calculations. Regardless of how many items are in each category (as shown by the white circles in the pie chart example above), the category weight remains the same. Additionally, you can create an Average grade column to calculate statistics for all columns that are in a particular category. Gradable items that are in that category would automatically be included in the average calculation. Categories are helpful in organizing and utilizing the Grade Center. If you assign columns to categories you would be able to sort the Grade Center by a specific category to compare how the students scored in the category. You can use categories with Smart Views in order to have only columns associated to specific category or categories shown in the Smart View. Goto the [Control Panel] for the course and click on the [Grade Center] link to expand it. Click on [Full Grade Center]. Roll your mouse over [Manage] on the menu bar and select [Categories] from the drop down menu. Click on the [Create Category] button. Enter a name for the Category then click [Submit]. Roll your mouse over the category you would like to like to edit/delete then click on the arrow to the right of the category name. Select the appropriate action from the shortcut menu. NOTE: You can delete any category you created as long as the category is not in use. Default categories cannot be deleted. Categories currently in use will not have the Delete option. A weighted grade column is a calculated column that displays the calculated result of component parts (columns and/or categories); each part is worth some percentage of the total. You can create a weighted grade based on any column and/or category in the Grade Center. 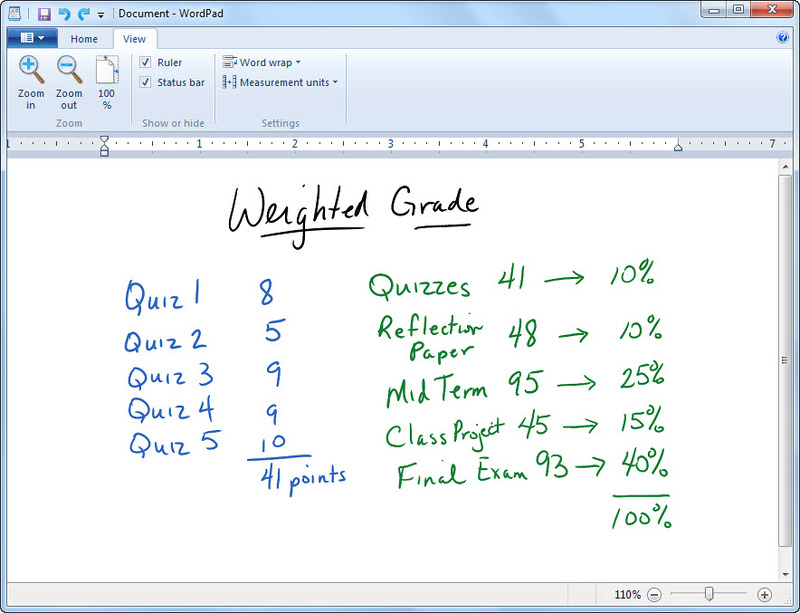 For example, you can create a weighted grade column that calculates the final grade for the course. 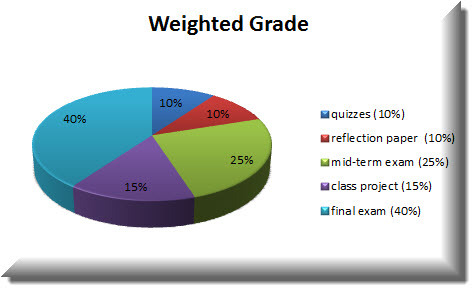 Categories such as Test, Discussion, and Assignment would be given a certain percentage of the final grade along with the percentage for other grade columns (e.g. Mid-term, Final Exam). Go to the [Control Panel] of the course you want to add a weighted column. Click on the [Grade Center] link to expand it. Click on [Full Grade Center]. Move the mouse over the [Add Calculated Column] button and select [Weighted] from the drop down menu. Enter a name that describes what the weighted grade column is in the Name field. Grade Center display name and description are optional. Select how you would like the results of the weighted grade to be shown by clicking on the pull down arrow and selecting primary display from the list. Secondary display is optional and will only be shown in the Grade Center. In the select columns section, choose which grade columns and/or categories will be used in the calculation of the weighted grade by clicking on the grade column or category and then clicking on the respective arrow to move the column/category over to the selected columns area. Enter the weight percentage to be applied to each column/category you selected. The total weight must equal 100%. When selecting a category you can choose to weigh columns equally or proportionally and whether to drop grades in the category or to use the highest or lowest grade in the category. Choose whether to calculate the weighted grade as a running total which would include only the columns that have been graded in the calculation. In the options section you should indicate whether you want to include this weighted grade column in grade center calculations, show the weighted grade column in My Grades, and show statistics for the weighted grade column in My Grades. My Grades is what is shown to your students when they go into your course. 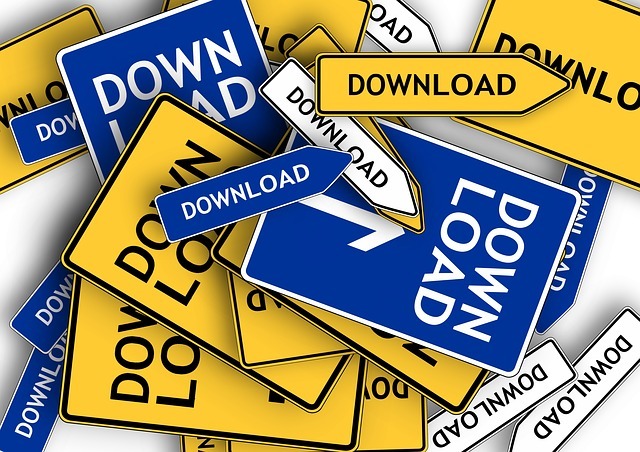 Click [Submit] when you are finished entering all your information and selecting the options. The weighted grade column will be added as the last column in the Grade Center. You can create rules to apply color to the cells in the Grade Center. 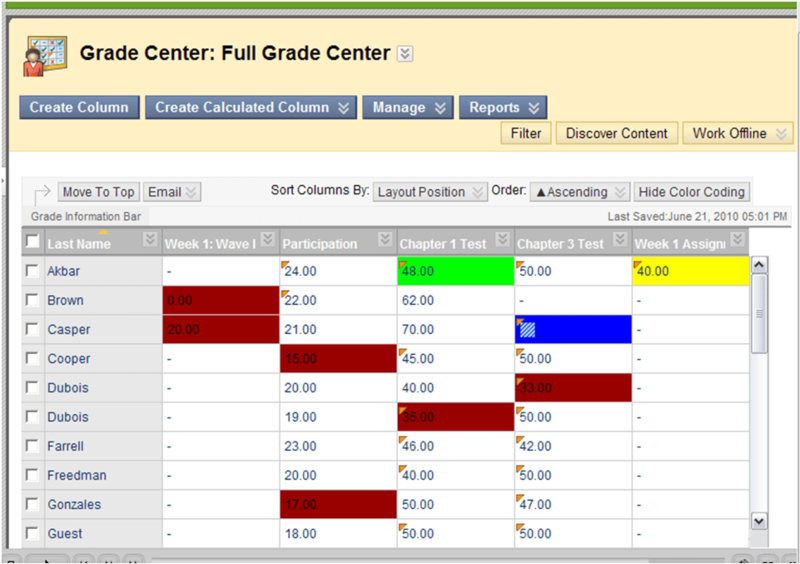 Creating color rules in the Grade Center provides visual indicators to help you interpret information quickly. For example, you can use yellow to highlight graded items with failing scores so students and columns that require attention are prominent. Also, you can assign colors to the following grading statuses: In Progress, Needs Grading, or Exempt. By default, color coding is not enabled in the Grade Center, and to use color coding you need to enable it. After you define and save the color rules, the color coding applies to all Grade Center views. Go to the [Control Panel] of the course you want to add color coding to. Click on the [Grade Center] link to expand it. On the action bar, point to [Manage] menu, and then select [Grading Color Codes]. On the Grading Color Codes page, select the check box for Enable Grading Color Codes. In the Color Coding Options section: For each Grading Status, click the down pointing arrows icon in the Background Color column to access the Swatch Color box. In the Swatch Color box, select a color and click [Apply] to save it. In the Grade Ranges section: Click [Add Criteria] to create a color rule. In the Criteria drop-down, select Between, More Than, or Less Than. Type a percentage in the box or boxes. For Background Color and Text, click the down pointing arrows icon to access the Swatch Color box. Select a color and click [Apply] to save it. Click [Add Criteria] to create an additional Grade Ranges field. An external grade is the grade a student would see in the Blackboard Report Card module, which is a tool we do not currently use. One column in the Grade Center must be set as the external grade column. The Total column is the external grade by default. If you set another column as the external grade and change your mind, you can simply reset the Total column as the external grade by choosing “Set as External Grade” in the dropdown menu within the column header. Alternatively, you can set any other column to be the external grade. 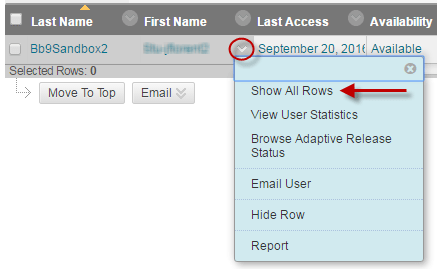 When you view the dropdown menu within the column header for a column that is set to be the external grade, you will not see the "Show/Hide to Users" option. To hide an External Grade column from the students' view, you should edit the column information and choose "No" for the "Show this Column to Students" option. Note: Any column that is set as the External Grade cannot be deleted. If you want to delete the column that is set as the External Grade column, you will have to set another column to be the external grade first. Once you do this you will be able to delete the column.